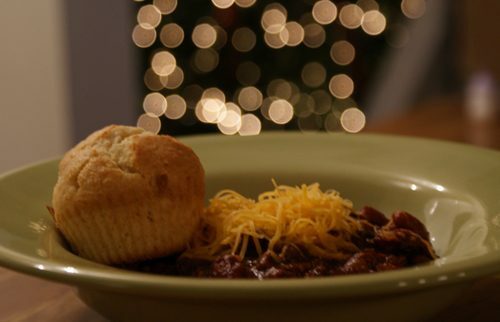 Nothing says comfort food to me like a good pot of spicy chili on a cool winter night. My typical chili recipe consists of a packet of chili seasoning, but I’m trying to cook more from scratch, adding one or two new recipes to my repetoire at a time, and chili seemed like a good choice for my latest attempt. I scoured AllRecipes.com for a recipe and then modified this chili recipe and this seasoning mix to create my own. It was spicier than I intended after simmering in the crockpot all day — and I ended up having to make my kids a separate meal — but it was very tasty and made a perfect lunch in the days that followed. In a small bowl, stir together spices and sugar.In a large saucepan, saute the ground beef over medium heat until it's browned. Drain grease. Add the seasoning mix, tomato sauce, salsa, and kidney beans, or combine everything in the crockpot. Mix well and simmer for at least an hour. The longer you simmer, the better it gets! Serve with shredded cheese and cornbread. What’s your favorite winter comfort food?